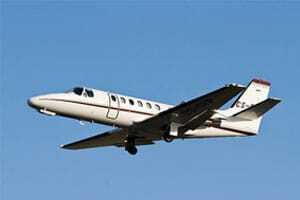 One of the favorable side effects of flying in the Cessna Citation Jet 2 aka CJ2, is its fuel efficiency. While you are flying high in your private jet charter, the CJ2 is cruising at an efficient average fuel burn of 140 gallons per hour. The fuel burn economy can be largely attributed to the two Williams/Rolls-Royce FJ44-2C turbofan engines, each of which delivers 2,400 lbs of thrust on takeoff. Rolls-Royce has a successful aviation history and was the engine supplier for the L-1011 and other aircraft. There is more efficiency at take-off. The CJ2 can take off in just 3,420 feet at sea level, or in 5,080 feet on a runway at an altitude of 5,000 feet. In just seventeen minutes you’ll climb to 37,000 feet with a maximum certified flight ceiling of 45,000 a long-range cruise speed of 352 knots, and a high-speed cruise of 407 knots. This corporate jet charter is easy to fly, can be single-pilot operated and flies faster and farther than its cousin, the CJ1. 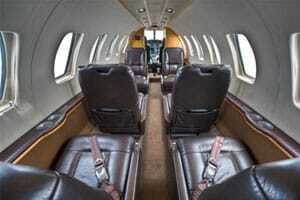 Flying to and from your destination in your business jet charter is both roomy and luxurious. Up to six passengers can relax in leather seats while up to 1,000 lbs. of their baggage is stored externally. The roominess of your business jet charter is further enhanced by a cabin that is 50 cubic feet larger than the CJ1, which adds one extra seat. The seats are typically laid out in a club arrangement with two forward-facing seats.